Discussion in 'transmission and Drive train' started by grumpyvette, Nov 9, 2008. 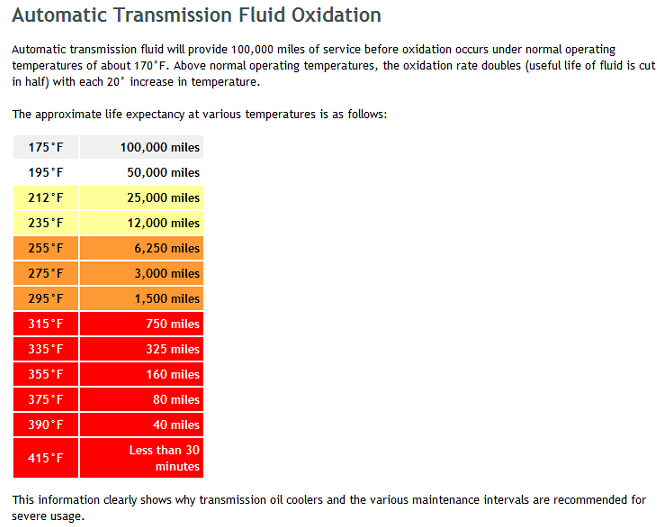 OVERLY HOT TRANS FLUID TEMPERATURE QUICKLY KILLS, A TRANSMISSION, SIGNIFICANTLY REDUCING TRANSMISSION DURABILITY, AND I'D POINT OUT THAT REDUCING THE TEMPERATURE OF TRANSMISSION FLUID ENTERING A RADIATOR HELPS REDUCE HEAT LOADS ON THE RADIATOR ,WHICH TENDS TO REDUCE ENGINE OPERATIONAL TEMPS. ITS GENERALLY SMART, too Do all you can to keep fluid as cool as possible. 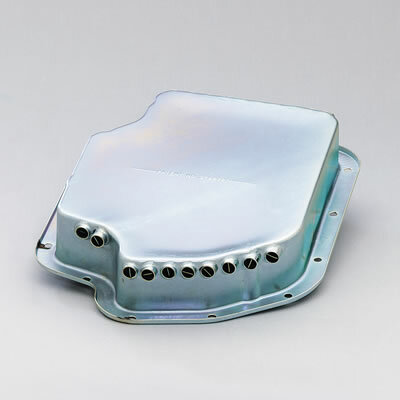 a deeper transmission oil pan with its increased fluid volume and in many cases a ribbed or finned surface that significantly increases the transmission pans surface area allowing it to dissipate heat rapidly, This is an option if you have the ground clearance under the car/trucks transmission, and remember, Higher stall converters produce more heat so they need more cooling. 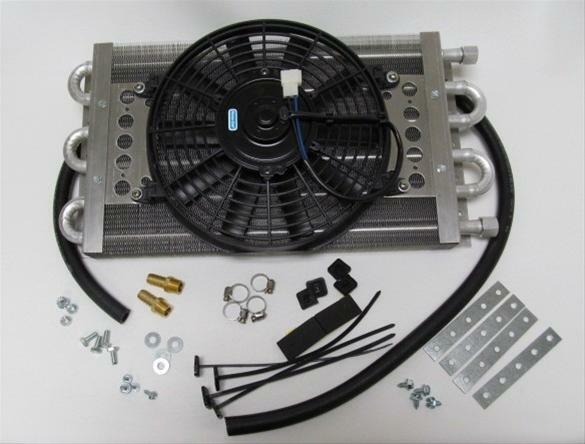 YOU may not need the Biggest cooler that can be installed , but you obviously should be calculating what will be needed and have that installed, and coolers with an auxiliary electric fan are a huge asset, while a deeper ribbed transmission pan may help a auxiliary fluid cooler with a powered electrical fan, thats rated at 24000lbs-35000 lbs added to a performance car can produce a much more significant drop in trans fluid temps without the reduced ground clearance. 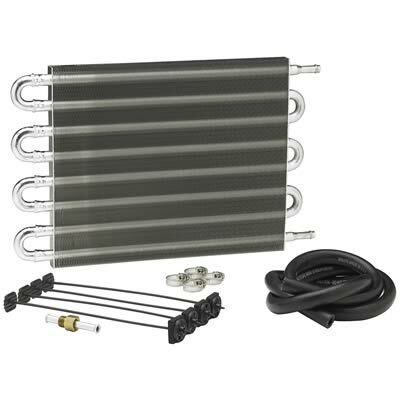 If your thinking of adding an oil cooler ,the first question ID have is WHY are you adding an oil cooler and WHAT are your current oil temps that require one? 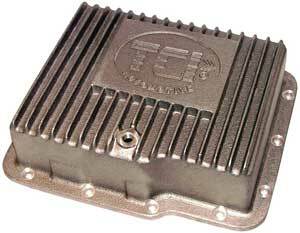 the same question applies to trans fluid coolers, but its almost mandatory to add a trans fluid cooler in the case of a higher stall converter as most stock transmission coolers are barely adequate to maintain reasonable temps under normal driving conditions on the stock components. most hydraulic supply shops can very easily fabricate flex hydraulic lines with matching ends at any length required,and theres plenty of auxiliary transmission fluid coolers on the market and from experience I can assure you that if you need a trans cooler the type with the built in fan and at least 1/2" or AN#8 0r in a few cases AN#10 fittings are by far the best choice,simply because, it allows you to expose a great deal more of the trans fluid to the cooling effects of the surface area of the auxillery oil/trans fluid cooler far faster and more efficiently, with far lower restriction to flow rates, and obviously youll need to carefully measure where your going to mount the cooler and run the lines before ordering a cooler but the larger the surface area the better in most applications. 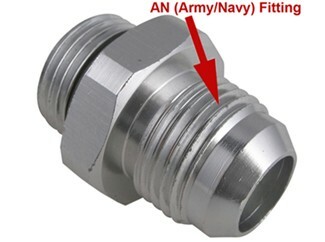 one of the most common mistakes less than experienced performance enthusiasts, face and very commonly over-look, is the fact that the internal cross sectional area on many hydraulic and fuel line fittings are considerably more restrictive to flow that the fuel limes or hydraulic lines inside diameter they were designed to be used with, and it varies a great deal between different manufacturers, now ideally the fittings internal passage cross sectional area is both consistent and the same or greater that the tube or hydraulic line size, it listed to match, , so a 1/2" inside diameter fuel line, or hydraulic lines?hoses, for example should have components for the connections and fittings that have significantly smaller internal cross sectional areas, it does you very little good to use lets say, AN#8 or half inch fuel lines if the internal cross sectional area of the connections and fitting used with those lines is only 3/8" or smaller in cross sectional area,this is an area where dealing with a local hydraulic supply shop that has the correct tools and fittings to custom fabricate your fuel lines, coolant or lubrication lines is a very good idea! the cost seems to be easier to justify. when I had that style transmission pan I had to put the car up on the lift about once a week and power wash out the tubes because I drive on a few dirt roads, regularly, and on a car that has the oil pan on the transmission less than 5" off the pavement the holes tend to fill with crud fairly fast, I eventually swapped to the cast aluminum pan with external ribs that increased the surface area as it was stiffer, leaked less, at the gasket mating surface and was less maintenance. one of the first things I noticed when I installed a 8 quart baffled oil pan (further modified with extended sump) and a transmission and oil cooler on my car was the very noticeable drop in engine temps, in fact the engine had a hard time getting the oil temps up to 215F which is required to burn off moisture in the oil that gets into the engine if it sits for days in Florida, the cure was installing a 190f t-stat and a bye-pass/return on the oil cooler, that bye-passed the cooler with about 90% of the oil flow routed to the cooler until the oil got hot. if you want to keep the temp from making wide swings as the car runs..
# Small compact cars, No towing Coolers with GVW ratings of 10,000 to 16,000 lbs. 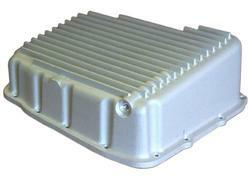 # Coolers with GVW ratings of 14,000 to 18,000 lbs. Towing up to 5,000 lbs. 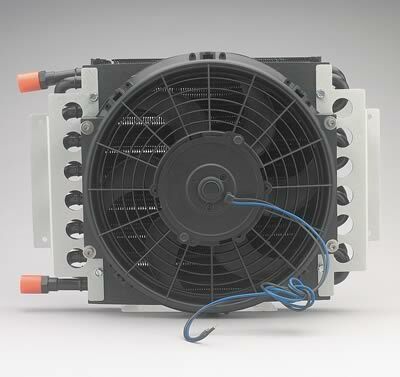 # Coolers with GVW ratings of 18,000 to 24,000 lbs. # Towing up to 7,500 lbs. 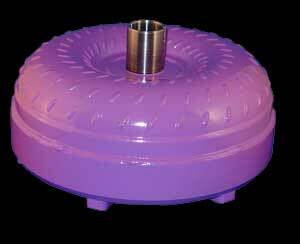 Coolers with GVW ratings of 22,000 to 26,000 lbs. Towing up to 10,000 lbs. 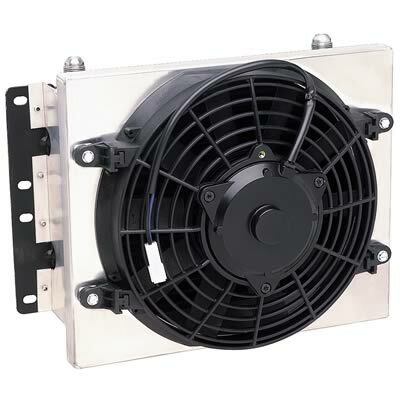 # Coolers with GVW ratings of 22,000 to 30,000 lbs. 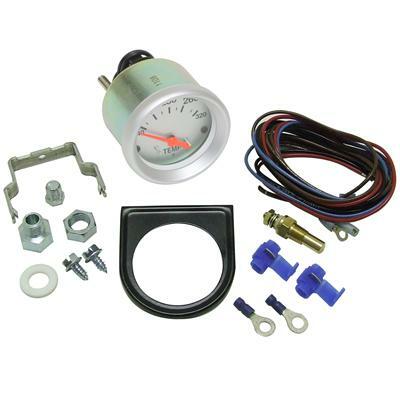 if you have a performance car with a high stall speed converter, you might want to be discussing the installation of a remote mounted trans fluid cooler on your car, now it might not be mandatory but its always a good idea on a car that has a high stall speed converter as they generate a good deal more fluid heat than a stock transmission. 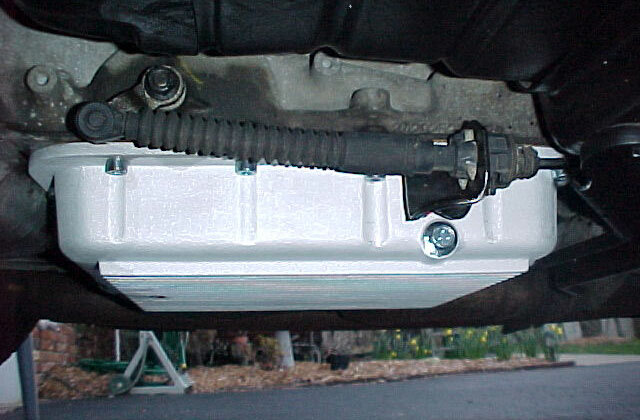 remote mounted oil filters can be used along with an oil cooler to to increase transmission cooler efficiency, and the remote filter and cooler used on a transmission also tends to increase fluid capacity ,and as a result the systems cooling efficiency as the longer the fluid remains in transit outside the trans dissipating its absorbed heat, the use of a auxiliary fan equipped fluid cooler on a performance transmission with a high stall speed converter tends to significantly increase its potential durability. 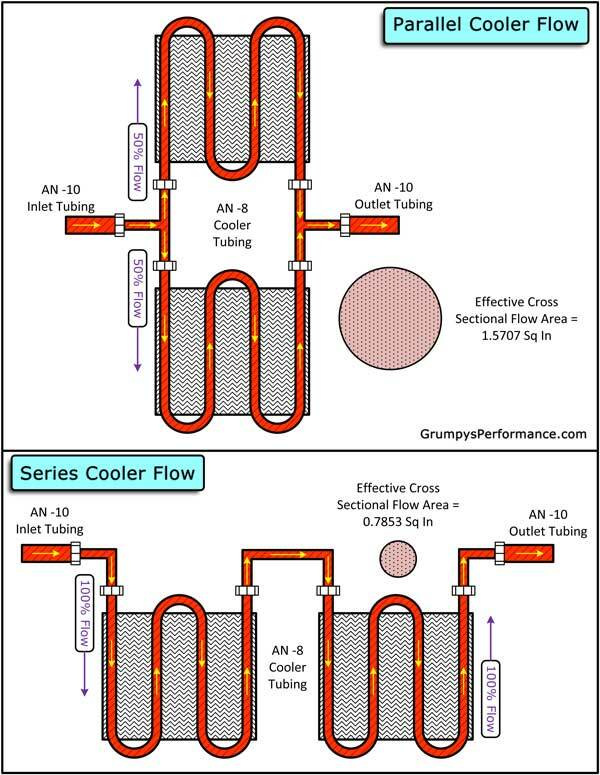 a rather common issue with adding oil coolers, is that many of the coolers available can significantly restrict fluid flow because of the small restrictive internal cross section of the internal tubing, AN #6 and 3/8" tube coolers can be quite restrictive, the AN#8 are better but DUAL AN#8 coolers and AN#10 lines generally work the best, and there's also frequently limited space to position a cooler in the outside cool air flow mandating a powered fans. "Did you see a noticable drop in temp with the derale pan? " at first it dropped temps about 15 degrees, after a couple weeks temps were back to orriginal levels, I flushed out the tubes with a high pressure car wash wand and temps dropped some but not all the way back, I closely inspected the tubes and found they were partly blocked even after repeated cleaning, so I pulled the pan , added an aluminum ribbed pan that held about a qt more than stock and installed the trans cooler, its been fine since. 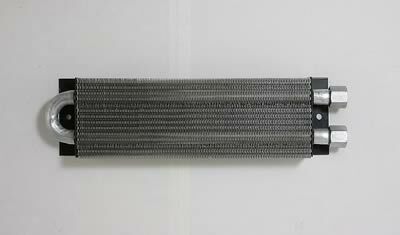 BTW HERES AN IMPORTANT TIP, IF YOUR INSTALLING A REMOTE OIL COOLER, IT is really common for guys to use lines that are far too small, that restrict flow oil flow or select a transmission or oil cooler that has to small of internal passages, shop carefully you want a MINIMUM of 1/2, or AN8 line size and 5/8" or AN10 is BETTER. 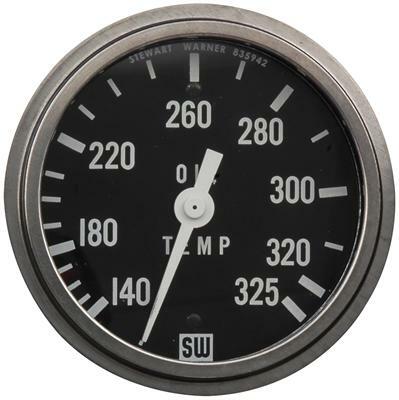 A common mistake is to think that all fittings of the same dash size have the same inside diameter. They do not. 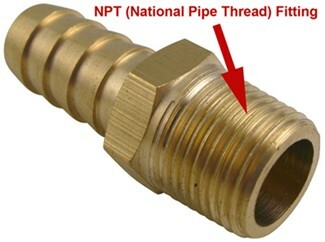 A common mistake is to think that a straight -6 fitting and a 90 -6 fitting of used on the same hose should both have the same inside diameter. They do not. 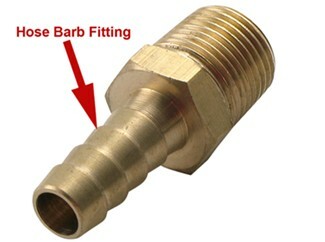 A hose with a straight fitting on one end and an angle fitting on the other end will have different inside diameters. 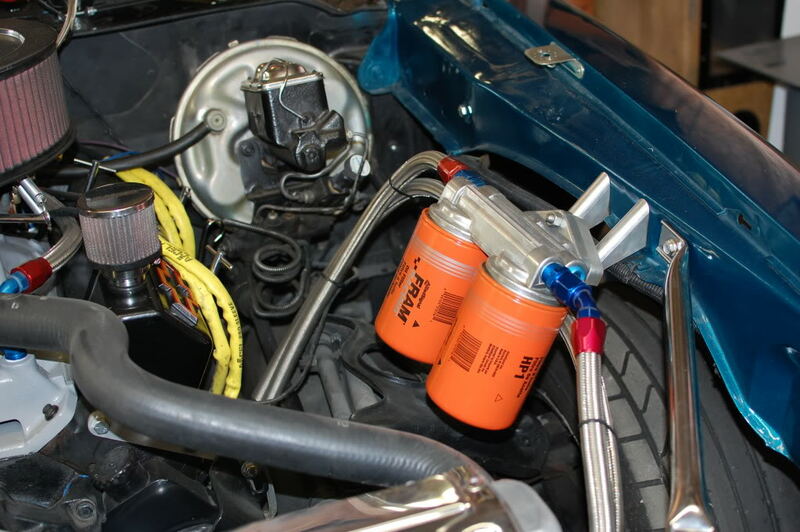 and it worked "ok" on the transmission fluid, (run thru the 4 pass side) but it was not as effective as I hoped it would be,as under hard accelleration the trans temps breifly peaked higher than I wanted) so I swapped, to the larger single use 6 pass unit. 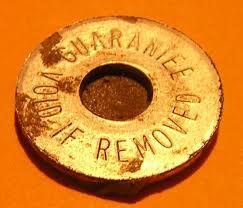 for the transmission fluid. and everything appears to be better, as the trans fluid temps stay more consistant. 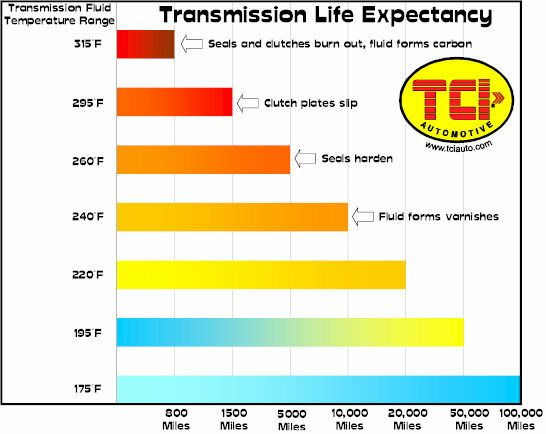 keep in mind high trans fluid temps always lower the transmission life expectancy, especially if your the average guy who beats on the trans and engine occasionally. 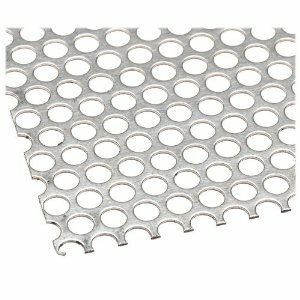 if you select 1/2" or AN#8 lines they are large enough in cross sectional area too make the transfer line size and length basically non-restrictive. 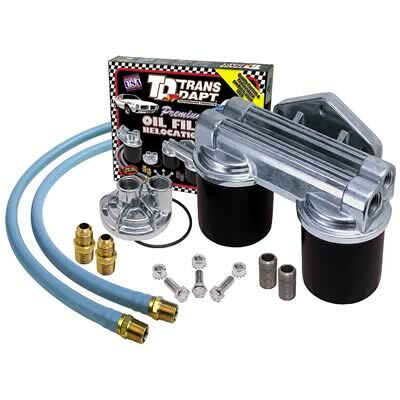 Id also suggest selecting the longer length, dual oil filters mounted vertically in a rather easy to access area of your choice making replacement easy and less likely to be a messy process. 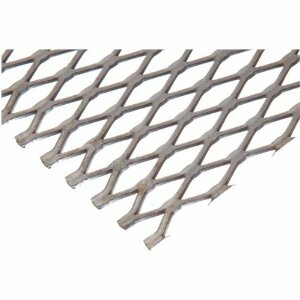 the longer length oil filters, pleated filtration medium, provide much greater surface area for filtration reducing the flow restriction. 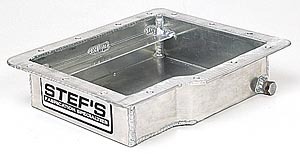 Is there a trans fluid "pickup" that would need an extension when going to a deeper pan? 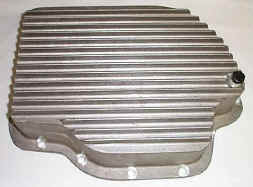 that would seem to be a very logical approach, but it doesn,t seem to be necessary or mandatory as no supplier of the deeper transmission pans Ive order those deep pans from even suggests you need one and if there was a few buck$ to be made selling you one someone would sure be doing it at a premium. 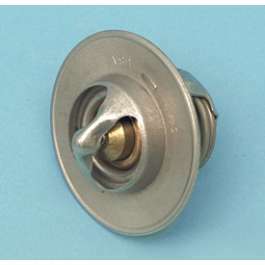 I found these (filter extension spacers bellow) at summit racing and called those transmission guys back , pointing out they were for sale, both transmission pan suppliers pointed out that there were internal post supports designed for filter support at the stock depth, and lowering the filter would require cutting the support posts, they re -confirmed its not necessary. 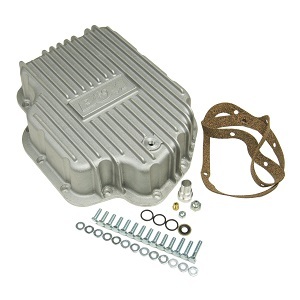 IM inclined to aggree as IVE used the aluminum ribbed 2 qt oil pans with a stock filter and an additional oil cooler with ZERO problems for many years on several different cars making over 450hp or more! Thanks. I've got a deep pan sitting on a shelf, but I wasn't sure about the pickup. If I remember correctly, I've seen a pickup extension at Summit, but it doesn't sound like I need one. 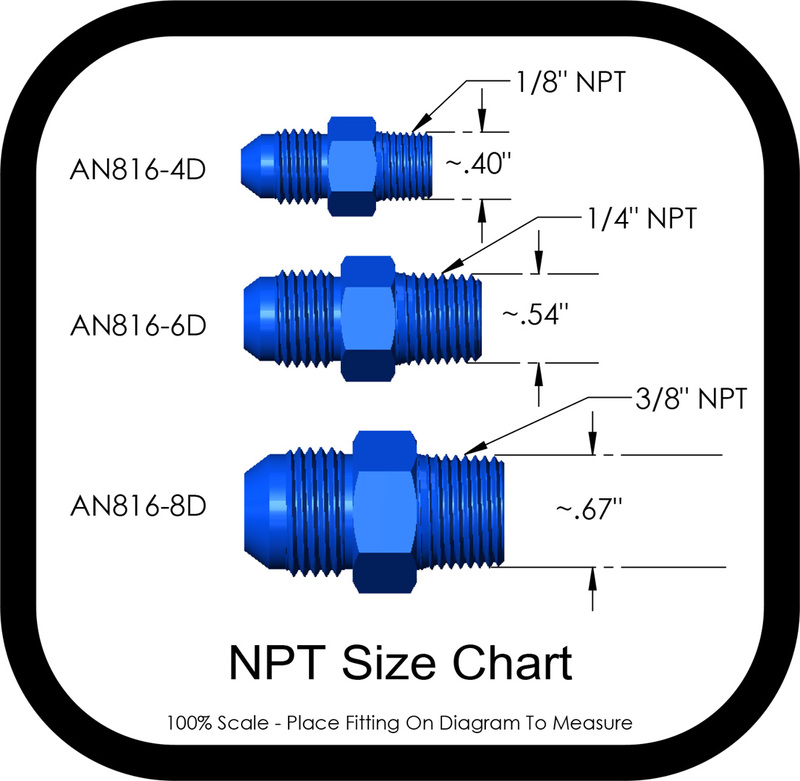 one factor thats frequently over looked is the oil feed and return line internal size and line heat rating,THINK IT THRU, now it should be obvious that fittings tend to have smaller more restrictive holes thru them than the hose internal dimensions of the fittings used with that hose, a fitting designed for 3/8" hose wont allow full 3/8"hose or component oil flow rates, AN-6 is normally considered about equal to 3/8" but thats doesn,t tend to be true, AN-8 size fittings are usually used to get decent flow in a 3/8" oil cooler , if your oil cooler has 3/8" internal passages youll want an AN#8 line size too insure the MINIMUM 3/8" internal passage size is maintained , and you really NEED a full 1/2" or AN#10 size fittings and internal fluid transmission cooler lines to a fan cooled trans fluid cooler rated at at least a 24000 lb vehicle weight for race /performance use, and not restricted by use of the internal passage size of AN#6 fittings which are at best minimal and only delay the heat build-up related problems. and access to get the cooler in and mounted and connections made too it! 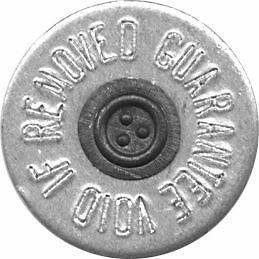 due to the connections and hoses required or forgetting about the thickness or lack of easy access. 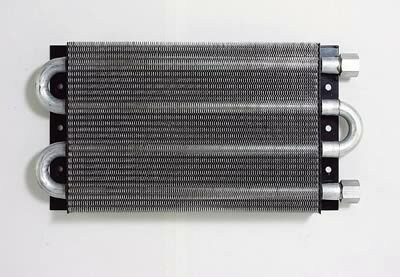 and reduces the heat load on the existing radiator. to monitor the fluid temps certainly won,t hurt either. 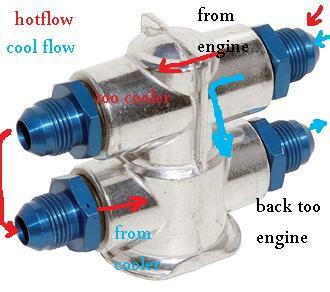 remember your goal is to provide a steady flow of transmission fluid at about 170F to the transmission, if you run the trans fluid thru the cooler then thru the radiator it will get no cooler than the engine coolant temp which usually runs in the 190f-220f range in most cars, adding a transmission fluid filter is a good idea if you race the car or regularly subject it to hard use. 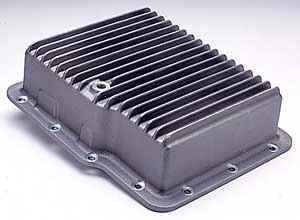 the first mistake many guys make when installing a transmission cooler is buying one before measuring the location they intend to install it at for clearance and the second common mistake is buying one that's either too small to effectively remove heat fast enough to keep the transmission fluid at the ideal 170F -175F range, or too large to install in the intended location. 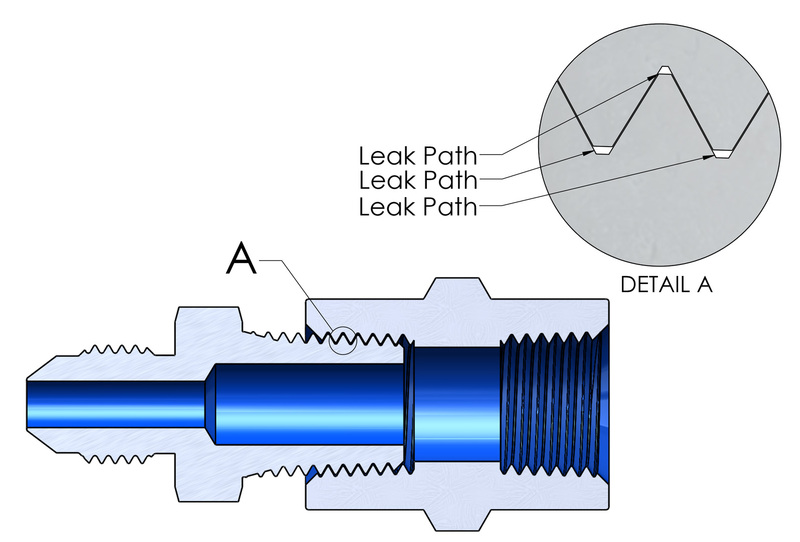 if you bring the current fittings that fit the transmission to a local hydraulic supply shop along with the exact length of the lines you need and explain what your trying to do , they can fabricate the correct, high pressure and high heat tolerant, transmission fluid lines to your exact specifications for VERY REASONABLE COST, thus preventing what might otherwise become a potential weak link. 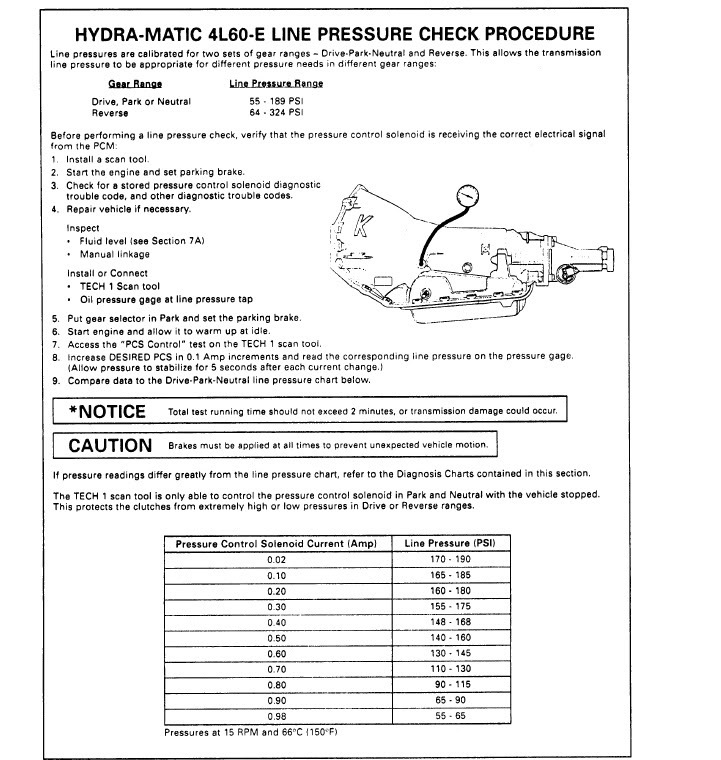 common rubber fuel line will NEVER hold up under the heat and pressure of a transmission fluid transfer line ,long term. its bound to be really a P.I.T.A. 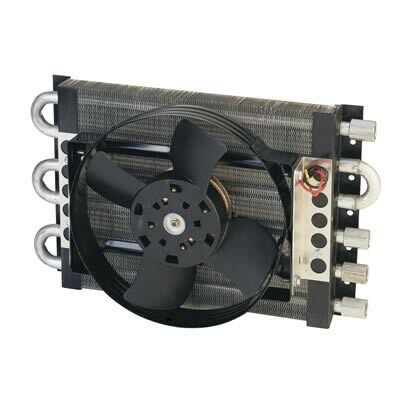 to find the trans cooler you bought won,t fit or it can,t cool the fluid sufficiently, so do some measuring and research on the flow and cooling capacity of the components you select. 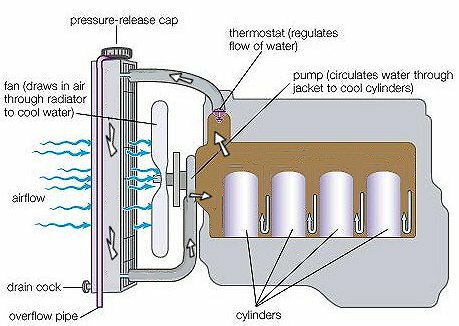 now it should be obvious that a tans cooler with a built in fan will generally cool more efficiently than a simple finned heat transfer unit because the fan can force a far greater volume of air over and thru the fins to absorb and transfer heat to the surrounding air. 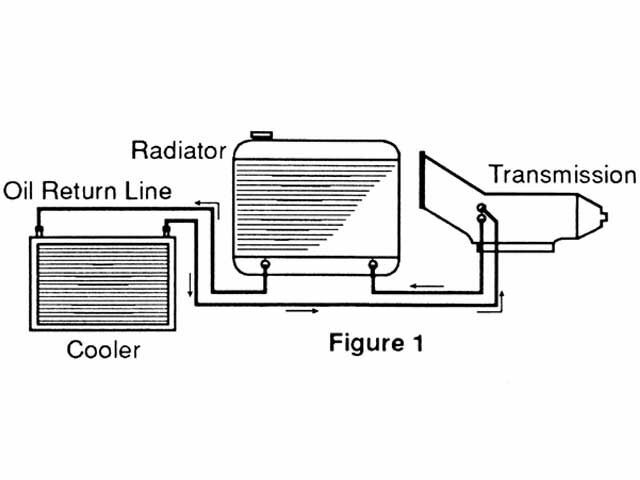 the next problem many guys seem to run into is line size, line routing and fittings, for some reason theres a tendency among some guys to always want to install the trans cooler in front of the radiator , while this places it in a good area to be exposed to cool air in most applications the hot air that flows behind the cooler is now expected to cool the radiator, which it obviously can,t do as efficiently as the previous cool air before the trans cooler installation, so your in effect curing one problem by causing a slightly different problem. 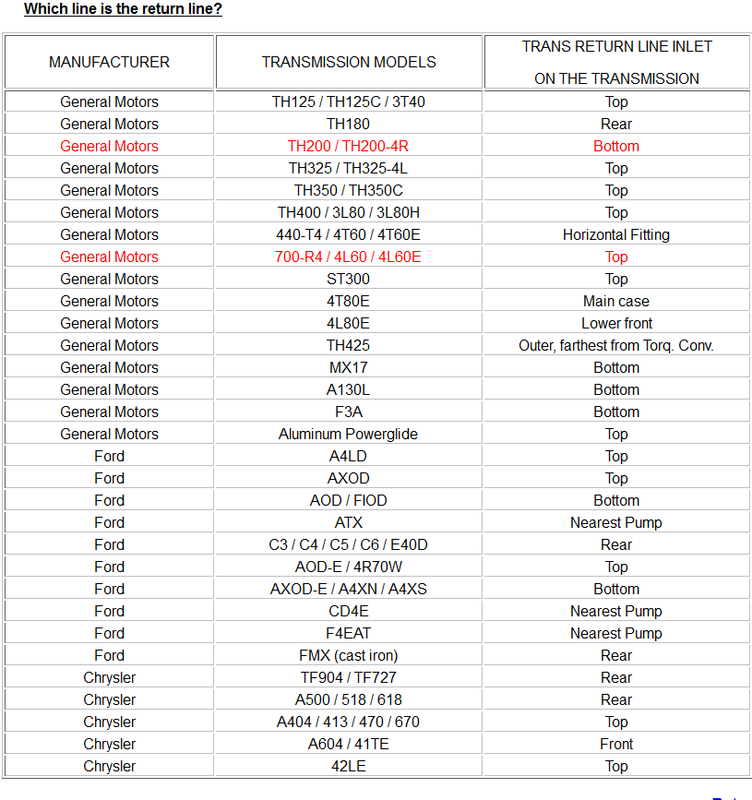 its best to locate a trans cooler and its lines and t-stat where it can get its own dedicated supply of cool air for its electric fan,but just as obviously theres limitations in most cars where you can install a cooler due to clearance issues. 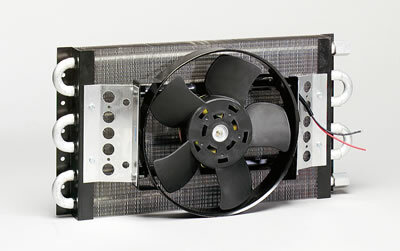 if you have the room there that might be a good option, but remember the size and air flow rates have a huge effect on how effective the trans fluid or oil cooler will be and just (HAVING ONE) doesn,t cure the heat issue, its got to be large enough to effectively transfer the heat to the air flow and be effective at reducing heat, once both the engine and transmission temps are up to operational range, and in many cases that takes a fairly large cooler with an effective fan. as an example I helped a guy I know ANDY who has a 67 chevy pick-up truck with a 496 BBC engine and TH400 transmission and a 3.54:1 rear gears, too, get his oil cooler working correctly. because his trucks basically a weekend toy used mostly as a semi race, drag car,and local street hero, that runs mid 11 seconds in the 1/4 when its not breaking drive train components. he found he needed a trans cooler. never one to give up,ANDY finally, pulled one of those two coolers and replaced the smaller one with a larger cooler with a fan,and left the larger non-fan equipped cooler plumbed in series under the truck bed, and wired the fan on the new larger cooler to work as soon as the ignition was powered up, this proved to be effective and last time I saw the truck he stated it cured his trans fluid over heating issues. 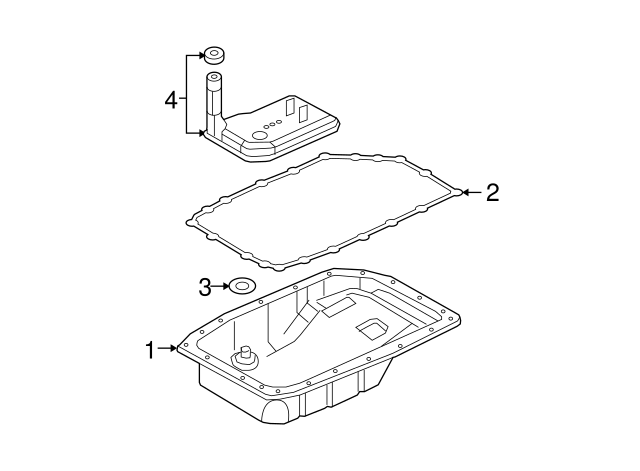 before you go installing an extra deep transmission or engine oil pan on your car its a really good idea to have someone measure the distance from the cars current oil pan or transmission pan to the pavement WITH YOU AND A FRIEND SITTING IN THE CAR..watch the video before you go spending a great deal of time and money swapping to the deeper oil or transmission pans. trust me your not the first nor will you be the last guy to do that without checking only to find out its an expensive mistake. WATCH VIDEO...and think about all the speed bumps, concrete curbs, high manhole covers ,bits of road trash, and pot holes that your car travels over in a years time. 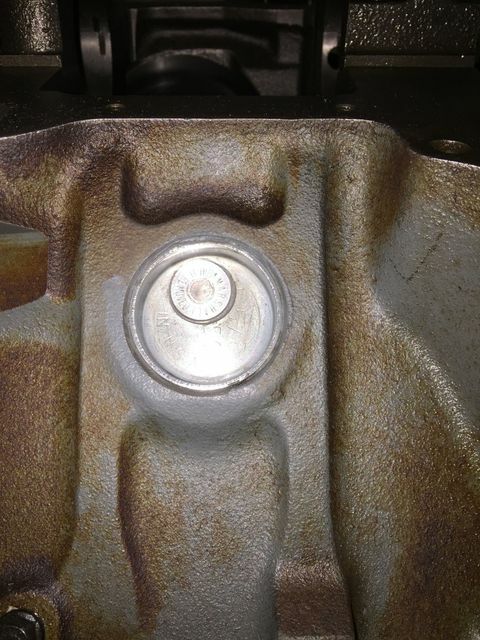 Id strongly suggest a 3.5" MINIMUM under the car clearance, between the pavement, headers and other components with you and a friend sitting in the car and a skid plate is certainly not a bad idea. on his 4l80e transmission, I spent time yesterday helping him install it to get a better feel for that transmission. not a huge reduction but hes fine as it was running about 170F, now he says its about 165F keep in mind the truck has about 31" diam. tires and a 4.11:1 rear gear and it was in the mid 80s around here at the time. 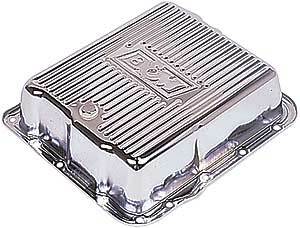 I suggested an added trans fluid oil cooler but that will wait on finances. theres good info but theres a few ways to improve the process.